Nokia Bets On virtual reality: Nokia hopes its camera OZO sparks a consumer revolution. OZO: The Future of Filmmaking - The new Virtual Reality Camera from Nokia - OZO, the VR camera designed for professional creators and storytellers - Filmmaking of the future will take audiences on a truly immersive journey. Ahead of the official launch of #OZO on November 30, innovators Ted Schilowitz, Sid Ganis and Steve Schklair expounded on how #OZO will affect the entire film industry. with the remaining 18.5% from Others. In an analysis conducted by the Boston Consulting Group, 52% of all global growth between 2014-2016 can be attributed to China and the United States. While China may be slowing and U.S. growth isn’t what it used to be, these two economies still dominate due to sheer size and impact. While India is contributing 6.5% of global growth during this time period, Russia has struggled since oil prices collapsed, and is negatively impacting global growth by contracting -1.3% through 2016. The remaining BRIC, Brazil, has flatlined and is contributing 0.0% to world economic growth in the same timeframe. Diwali Special: Hyperlocal Space - A Bloomberg India special Diwali edition of E-Inc: a focus on the hyperlocal space--groceries contribute up to 70% of total retail in India and online Grocery shopping is one of the fastest growing category--panelists include Albinder Dhindsa, Co-Founder Grofers; Navneet Singh, Co-Founder & CEO PepperTap; Abhinay Chaudhuri, Co-Founder & CEO, BigBasket. Published on Nov 16, 2015. See also: India’s Grofers Grabs $120M To Bring Offline Merchants Into The On-Demand World | TechCrunch: "... Grofers, an Instacart-style app that links up with local, offline merchants to delivery groceries, medicine, flowers, and other daily items to customers, has raised $120 million led by new investor SoftBank. The Series C round also included existing backers DST’s Apoletto Managers, Tiger Global and Instacart investor Sequoia Capital..."
"In 1973, the U.S. Defense Advanced Research Projects Agency (DARPA) initiated a research program to investigate techniques and technologies for interlinking packet networks of various kinds. The objective was to develop communication protocols which would allow networked computers to communicate transparently across multiple, linked packet networks. This was called the Internetting project and the system of networks which emerged from the research was known as the "Internet." The system of protocols which was developed over the course of this research effort became known as the TCP/IP Protocol Suite, after the two initial protocols developed: Transmission Control Protocol (TCP) and Internet Protocol (IP). In 1986, the U.S. National Science Foundation (NSF) initiated the development of the NSFNET which, today, provides a major backbone communication service for the Internet .... A great deal of support for the Internet community has come from the U.S. Federal Government, since the Internet was originally part of a federally-funded research program and, subsequently, has become a major part of the U.S. research infrastructure. During the late 1980's, however, the population of Internet users and network constituents expanded internationally and began to include commercial facilities. Indeed, the bulk of the system today is made up of private networking facilities in educational and research institutions, businesses and in government organizations across the globe ... Over its fifteen year history, the Internet has functioned as a collaboration among cooperating parties. Certain key functions have been critical for its operation, not the least of which is the specification of the protocols by which the components of the system operate. These were originally developed in the DARPA research program mentioned above, but in the last five or six years, this work has been undertaken on a wider basis with support from Government agencies in many countries, industry and the academic community. The Internet Activities Board (IAB) was created in 1983 to guide the evolution of the TCP/IP Protocol Suite and to provide research advice to the Internet community.... Throughout the development of the Internet, its protocols and other aspects of its operation have been documented first in a series of documents called Internet Experiment Notes and, later, in a series of documents called Requests for Comment (RFCs). The latter were used initially to document the protocols of the first packet switching network developed by DARPA, the ARPANET, beginning in 1969, and have become the principal archive of information about the Internet. At present, the publication function is provided by an RFC editor." Source: A Brief History of the Internet & Related Networks | Internet Society (emphasis and link added). See also: Did We Build the 'Right' Internet? (An Interview with Prof Andrew Russell): "... If there are true villains, they are the national security state and the self-interested capitalists. They only want to increase their status and power, and often misrepresent the importance of their role and value in the development of the Internet. But I think if we looked closely even at these 'villains', we would see simple humans, with human flaws, each pursuing a certain set of interests for reasons that made sense to them, no better or worse than the rest of us...."
"Hello everyone, Assistant Secretary Strickling has asked that I share this with the CCWG. Best regards, Suz (Suzanne Radell of NTIA, US Department of Commerce). "NTIA has been closely following the discussions in the CCWG-Accountability, including the recently concluded small group on stress test 18. As has been the case throughout the work of the CCWG, we are impressed by the time and dedication so many of you are putting into these important discussions. We thank everyone for their efforts as the group works to finalize the proposal for publication on November 30. "NTIA has long believed that governments, like all stakeholders, have an important role to play within multistakeholder processes, including ICANN. Our position on that has not changed. As the CCWG finalizes its proposals for enhancing ICANN’s accountability, we feel we should reiterate our view, as we stated last July, that ICANN preserve and clarify the current practice of the Board in responding to advice it receives from the Governmental Advisory Committee (GAC). Specifically, ICANN should amend its Bylaws to clarify that the Board is required to enter into a formal consultation process with the GAC only where it receives GAC advice that is consensus advice based on the current definition within the GAC’s Operating Principles, that is, advice to which no GAC member has raised a formal objection. "We want to make clear that nothing about this proposal is intended to limit how the GAC determines what advice it submits to the Board. As the Bylaws make clear, the Board is obligated to duly take all GAC advice into account. However, it is not practicable for the Board to give GAC advice special consideration unless it is consensus advice as currently defined in the GAC Operating Principles. Anything less than consensus places the Board in the awkward, if not impossible, position of trying to choose between governments with conflicting opinions. NTIA sees any deviation from the current standard of consensus as introducing instability into the system while also inadvertently diminishing the important role of governments. Accordingly, every time the GAC provides consensus advice that it expects to trigger the special Bylaws consideration from the Board, it must be unambiguous and consistent with the current definition in the Operating Principles. Asking the Board to interpret any other threshold of support seems counter to the spirit of the CCWG’s efforts to empower the community in a clear and consistent manner. It also undermines the work done to implement the relevant recommendations of ATRT1 to fix what the community diagnosed as a dysfunctional Board-GAC relationship. "We are aware that some countries are concerned that the current GAC Operating Principles could lead to a single-country veto of GAC advice to the detriment of other countries. We too share that concern. But the right place to deal with that issue is not at the last minute in the CCWG but in a more reasoned and full discussion of this issue within the GAC. NTIA stands ready to participate in and contribute to such a discussion to resolve that concern at the appropriate time and place." As long as we do as we are told, I am sure we can achieve a result that is acceptable to NTIA. What is obvious to me now, is that not only did the NTIA want a solution that was not dominated by governments, a goal I strongly agree with, they also did not want a solution where the GAC stands with equal footing as a stakeholder, which makes me uneasy. But we can be thankful, at least we now know what we must do if we want approval. Before now there was ambiguity because as long as the solution did not give government primacy I thought we would be ok. Now I realize we can't even have equality. This is not disarray but well ordered. We had one serious issue pending and now that has been taken off the table. We can expect that GAC will not be able to approve of the accountability proposal as I expect that [there] will be at least one [or] more member[s] of the GAC disappointed enough to formally object to the solution as constrained by NTIA. So as long as the solution is acceptable to all the SOs and to ALAC, ... [we’ll] still be ok with the latest NTIA condition, we should be successful at reaching the end of the discussion. We also have a good indication of the power of NTIA over ICANN as a backstop for any who doubted that power. Anytime the US speaks, ICANN jumps. We should rejoice and be thankful as we have less to decide upon. -- Avri Doria, active stakeholder in ICANN and GNSO since 2005, recipient of the ICANN Multistakeholder Ethos Award (given for the first time at ICANN 50, June 2014); also active in IGF, IETF, ISOC, and other groups. CCWG-Accountability met on Thanksgiving morning, November 26, 2015 (UTC 14:00). Notes, transcript, and recording may be found on the wiki page. The provisions now dealing with ST18 are summarized here. The CCWG-Accountability third draft proposal is scheduled to be published for public comment on November 30, 2015. The comment period is scheduled to close December 21, 2015. Square CEO Dorsey: IPO Helps Us Accelerate - Jack Dorsey, founder and chief executive officer at Square, discusses the company on its first day of trading after an initial public offering and where he is focused on finding growth. He spoke on "Bloomberg Markets" (Nov 19, 2015). Unicorn: a term in the venture capital industry to denote a start-up company with a valuation (based on fundraising rounds) of at least $1 billion dollars. Android Dev Summit, Day 1 Video Replay (Streamed live on Nov 23, 2015): Follow along with the inaugural Android Dev Summit. Technical sessions from the Android Engineering team, live from the Computer History Museum, Mountain View, California. SoftWear Automation is disrupting the $100B sewn products industry by replacing sewing labor with cutting edge robots. Press release: Atlanta, Oct. 26, 2015 /PRNewswire/ -- "SoftWear Automation Inc., developer of fully automated sewing technologies, today announced the launch of its LOWRY line of advanced sewing robots. Built around patented machine vision, robotics and computing technologies, the LOWRY system automates the transfer and sewing of fabric, eliminating the need for trained seamstresses. The company is taking and fulfilling orders for custom LOWRY systems, and has deployed numerous systems in production environments in the southeastern U.S...."
Alibaba Cloud Computing (www.aliyun.com), a provider of cloud computing services to businesses and entrepreneurs. How to Achieve Sustainable Growth, Make It Profitable - William McDonough & Partners Founder William McDonough (architect, designer) discusses the business of sustainability. He speaks on "Bloomberg Markets." Published on Nov 12, 2015. Thomas Heatherwick, 2015 Design Innovator - With dozens of projects in the works, the British designer Thomas Heatherwick is making a name for himself with freestyle invention and elegant problem-solving. Published on Nov 5, 2015. About | Heatherwick Studio: "Established by Thomas Heatherwick in 1994, Heatherwick Studio is recognised for its work in architecture, urban infrastructure, sculpture, design and strategic thinking. Today a team of 170, including architects, designers and makers work from a combined studio and workshop in Kings Cross, London...."
Tory Burch, co-chief executive officer at Tory Burch (toryburch.com), and David Kirkpatrick, chief executive officer at Techonomy Media (techonomy.com), discuss the Square IPO, unicorn valuations, innovation, startups, tech IPOs, and why Tory Burch will remain a private company. They speak on "Bloomberg ‹GO›" on November 19, 2015. Tory Burch: We Will Award 10 Entrepreneurs $10,000 - In the video above, Tory Burch, co-CEO Tory Burch, discusses the company's new fellowship program. She speaks on "Bloomberg ‹GO›." Google Is Using People Data to Make Happier, More Effective Employees - Laszlo Bock, Senior Vice President of people operations at Google, talks with Stephanie Ruhle about the quest for innovation at Google and the application of workplace data to motivate employees and create a better environment for workers and customers. 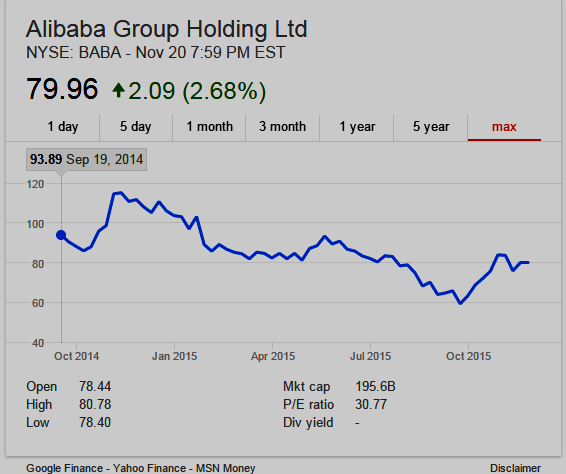 He speaks on "Bloomberg ‹GO›" November 11, 2015. UPDATE 24 Nov 2015: Yahoo CEO Marissa Mayer Faces Morale Challenge - WSJ: "When the Ms. Mayer is forced to deliver bad news, she employs what she calls a “jiu-jitsu move”—trying to create a diversion by producing tantalizing information, according to people who have worked closely with her. For example, Ms. Mayer created an accounting metric called “Mavens” designed to spotlight the growing parts of Yahoo. The grouping includes revenue from mobile, video, native and social ads but excludes Yahoo’s largest portion of revenue—its shrinking business of display ads on desktop computers." Yet Another Top Yahoo Media Exec Departs | Re/code: "...Barrett came to the Silicon Valley Internet giant in 2011 after a long and varied career in interactive media, including at the Los Angeles Times, ABC and Time Inc. He has most recently reported to Martha Nelson, the SVP of all of Yahoo Media. More pertinently, Barrett has been part of a major exodus of talent from Yahoo, which is still struggling under the leadership of CEO Marissa Mayer. Another top media exec, Ken Fuchs, also departed recently, as well as media head and CMO Kathy Savitt. Pressure on the former Google exec (Mayer) is increasing as press and also investors are calling attention to Mayer’s management and strategy for making the company relevant again..."
Forbes gives the details of the ongoing disaster at Yahoo: The Last Days Of Marissa Mayer? - Forbes: "... most say a confused strategy and mismanagement, specifically from Mayer, has undermined any attempts at a turnaround. Yes, she originally brought hope, a badly needed focus on products and a keen understanding of technology. But as pressure to deliver results has mounted, there’s widespread belief, as reflected in that employee survey, that she’s no longer up to the task. The past few months have seen a mass exodus..." (emphasis added) - See also: SunTrust stock analyst Bob Peck to Yahoo directors: Time to fire CEO Marissa Mayer? - Silicon Valley Business Journal - BTW: When did Marissa Mayer become Yahoo CEO? Answer: July 17, 2012. Allow video to load after clicking play. If video does not play on your device go to link above. IANA, ICANN Accountability, CCWG Crunch Time! Midnight Deadlines! 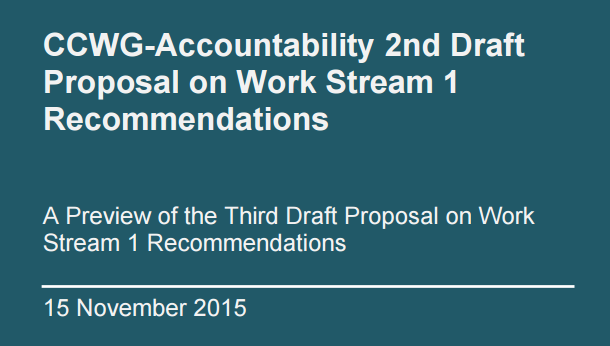 UPDATE 30 Nov 2015: CCWG-Accountability - Draft Proposal on Work Stream 1 Recommendations now open for comments. Comments close 21 Dec 2015 23:59 UTC. The webinars will be run online via Adobe Connect room (Strategic Initiatives Webinar). If you are interested in attending the webinar but would like to receive phone dial-in details, please send an email to acct-staff@icann.org and indicate your language request (if needed). The webinars will be recorded and transcribed. Live interpretation will be made available in English, Spanish, French, Chinese, Arabic, Russian and Portuguese. More info here. It's Crunch Time for the Cross-Community Working Group on Enhancing ICANN Accountability (CCWG-Accountability)--everyone is waiting on the CCWG to finish its work so the complete IANA Stewardship Transition Plan as requested by NTIA (US Department of Commerce)--IANA Functions Proposal (ICG) + ICANN Accountability Proposal (CCWG)--may be received by the ICANN Board, and in turn, transmitted by the ICANN Board to NTIA for review and approval. While some CCWG participants have questioned the CCWG timeline--see, e.g., here and here--so far, it's pedal to the metal as the steamroller moves on! Stay tuned--Domain Mondo is following this one closely. 10.45 AM Keynote IV: Getting smarter all the time: Semiconductor evolution for the IoT - Jeffery Torrance, Vice President of Business Development, Qualcomm Technologies, Inc.
Chrome and the future of the web platform--Chrome Dev Summit 2015: Chrome Dev Summit--Connecting you with Chrome Engineers--The event is sold out but you can still join on the livestream and explore how to build the new generation of web apps with DevTools, Service Worker and the new suite of APIs coming to the web. Code labs: Even if you're not in attendance, they'll be available online for you to work from the comfort of your own home or favorite coffee shop. Chrome Developer Summit - Day 2 video - day two is focused on diving deep into RAIL, Performance and Developer tools. Day 1: Progressive Web Apps: Learn how to build fast, resilient, app like experiences for the mobile web from Chrome engineers. Take away tips for smooth and fast loading, reliable access on flaky networks and for re-engaging with users. All sessions are available for on-demand streaming. 09:00 - 09:05 Welcome to the Chrome Dev Summit. Join our compères Paul Lewis and Jake Archibald for a touch of HTTP 203 and important announcements. 09:05 - 09:45 Keynote - Join Darin Fisher, VP of Chrome as he talks the past, present and future of the web. 09:45 - 10:15 Developing for Billions--Tal Openhiemer--With millions of people coming online every year, we are seeing a new diversity of users from around the word using the web for the first time. We’ll talk about the opportunity we have with these new users, the unique constraints and challenges in developing for them, and some of the capabilities the web and Chrome offer to help create the best possible experiences. 11:00 - 11:30 Progressive Web Apps are fast, robust, app-like experience built using Service Workers and other modern web capabilities. Join Alex Russell to get a deep understanding of how to build these modern web experiences. 11:30 - 12:00 Building and deploying a Progressive Web App at scale--Is it possible to build a Progressive Web App and launch it to millions of users? 12:00 - 12:30 Instant Loading with Service Workers--Jeff Posnick--Service workers can power your web app while offline, but they can also offer substantial performance benefits while online. We’ll explain how to structure your web app to optimize load time for initial and return visitors, and cover helpful service worker libraries that minimize the amount of boilerplate code you’ll have to write. 12:30 - 13:00 Increase Engagement with Web Push Notifications--Owen Campbell-Moore--Timely, personalized notifications save users the effort of manually checking for updates throughout the day and have enabled a host of new experiences from real time communication to live updates on breaking news. In this talk, we'll do a deep dive into sending push notifications to your web users on desktop and mobile, even after they've left your site. 14:30 - 15:00 Engaging with the Real World: Web Bluetooth and Physical Web--Scott Jenson & Vincent Scheib--Web Bluetooth opens up low level communication with an expanding ecosystem of BLE devices such as toys, vending machines, museum exhibits, kiosks and more. The Physical Web makes discovering and connecting to these objects trivial for users. Together they expand the reach of the web to even more devices around users. 15:00 - 15:30 Asking for Permission: respectful, opinionated UI--Elisabeth Morant--Access to new device capabilities such as background sync and bluetooth allow developers to deliver more meaningful experiences to the web than ever before, but also leave users open to a brand new set of privacy and security risks. We’ll be discussing how developers can best take advantage of the Chrome permissions model to build experiences that keep users coming back. 16:00 - 16:30 Polymer - State of the Union--Matthew McNulty & Taylor Savage--The Polymer library has come a long way. Since its 1.0 release at Google I/O and through the Polymer Summit this fall, Polymer has grown to be used by major companies on over a million web pages, and formed the foundation for some of the biggest recent Google web product launches. We’ll talk about the team’s vision and roadmap for the library and project overall, and show off some of the latest things we’ve been working on. 16:30 - 17:00 Building Progressive Web Apps with Polymer--Rob Dodson--With the combination of Web Components and Service worker, web developers have incredibly powerful and fundamentally new tools to build applications. We’ll explain how we on the Polymer team see these two technologies creating a whole new paradigm for building applications on the web, and how Polymer can help make it easier to build this brand-new breed of web application. 17:00 - 17:30 Accessibility--Alice Boxhall & Laura Palmaro--Join Alice Boxhall to learn about all the work that Chrome has been doing to make Accessibility simple for developers. Day 2: Deep dive into RAIL, Performance and Developer tools: Don't assume performance is as simple as following a simple set of dos and don'ts. Learn how to test performance following the RAIL model. All sessions are available for on-demand streaming. 09:30 - 10:00 DevTools in 2015: Authoring to the max--Paul Bakaus--In early 2015, the Chrome DevTools team has come to the realization that an expanding number of DevTools users aren't simply developers, but prototypers and designers. Thus, we've refocussed some of our efforts to ensure everyone can iterate quickly and efficiently on mobile-first, responsive page layouts. Tune in to learn about a few upcoming features that dramatically enhance your authoring workflow. 10:15 - 10:30 Introduction to RAIL--Paul Irish & Paul Lewis--Looking around at web performance advice today can be overwhelming: everything comes with caveats, disclaimers, and sometimes one piece of advice can seem to actively contradict another. Phrases like “the DOM is slow” or “always use CSS animations!” make for great headlines, but the truth is often far more nuanced. In this session we'll look at how to think holistically about performance, and how to prioritize optimization work that your users will notice and appreciate. 10:30 - 11:00 RAIL in the real world--Paul Lewis--RAIL is the Chrome team’s way of thinking about performance, but how can you apply it to your projects? Does it work as-is, or do you need to do tweak things first? Let’s take a look at what RAIL involves when the rubber hits the road. 11:30 - 12:00 Owning your performance: RAIL--Paul Irish--Join Paul Irish in a deep-dive of a site and how you can use Chrome DevTools to apply the principles of RAIL to diagnose and fix your site. 12:30 - 13:00 Quantify and improve real-world RAIL--Ilya Grigorik--You’ve mastered DevTools and tuned your application to follow all the RAIL best practices. Except, how it does perform on your users devices in the real world? We’ll take a look at existing, new, and upcoming APIs that will help you quantify and improve performance of your applications. 14:30 - 15:00 Deploying HTTPS: The Green Lock and Beyond--Emily Stark--In this day and age, all sites should be using HTTPS to protect their users’ privacy and security. Fortunately, Chrome is here to help you deploy HTTPS correctly. In this session we’ll cover new developer tools that will help you roll out HTTPS without a hiccup. 15:00 - 15:30 HTTP/2--101 Surma--HTTP/2 is coming. Actually, it’s here. Right now. It impacts not only your user’s experience but also the way you need to think about your website and webapps. Let’s see how HTTP/2 came to be and how it makes development easier. 16:00 - 17:00 Leadership Panel: Got a burning question about Chrome and the future of the web platform? Now is your chance to ask the leads of the Chrome project. CCWG-Accountability Issues Formal Update on Progress Made In and After ICANN54 in Dublin: "This is a brief and preliminary overview of the proposal for improving ICANN's accountability developed by the Cross Community Working Group on Enhancing ICANN Accountability (CCWG-Accountability) over the past year. It includes a very high-level summary of the main changes being proposed by the community and outlines what will be described in the full proposal. This 36-page document is designed to update the community on recent progress in and after ICANN54 in Dublin and raise awareness of the proposed enhancements to ICANN's accountability as a more detailed proposal is finalized. While this formal update reflects the current consensus positions of the group, there are outstanding elements that remain to be finalized. These finishing details are highlighted in the document, and will be confirmed and detailed in the Third Draft Proposal." (source: ICANN CCWG-Accountability; emphasis added). The full Third Draft Proposal will be published on 30 November 2015, for public review and comment, and will include "further explanation and detail about the accountability improvements" outlined in the Preview document. It will also "explain why the changes have been suggested, how the community arrived at these recommendations and the options considered and ultimately rejected in development of the proposal." Background: Over the last year, a working group of ICANN community members has been developing a set of proposed enhancements to ICANN's accountability to the global Internet community. This effort is integral to the transition of the United States' stewardship of the IANA functions to the global Internet community, reflecting the ICANN community's conclusion that improvements to ICANN's accountability were necessary in the absence of the accountability backstop that the historical contractual relationship with the United States government provided. The accountability improvements set out in this document are not designed to change ICANN's multistakeholder model, the bottom-up nature of policy development nor significantly alter ICANN's day-to-day operations. The main elements of the proposal are outlined below. Together with ICANN's existing structures and groups, these accountability enhancements will ensure ICANN remains accountable to the global Internet community. All of these community powers can only be exercised after extensive community discussions and debates through processes of engagement and escalation. The process of escalation provides many opportunities for the resolution of disagreements between the parties before formal action is required. Additions to the ICANN Bylaws to create an Empowered Community that is based on a simple legal vehicle that will act on the instructions of ICANN stakeholder groups to exercise the Community Powers. The Empowered Community is granted the status of a Designator (a recognized role in law) and has the standing to enforce the Community Powers if needed. Core elements of ICANN's governing documents (the Articles and Bylaws) being categorized asFundamental Bylaws that can only be changed with agreement between the ICANN community and the ICANN Board. A commitment to discuss additional accountability improvements and broader accountability enhancements in 2016, following implementation of this core set of accountability improvements. For more information read the entire announcement here. ICANN OPEN FORUM Transcript, IGF2015, Nov 11, 2015: "The following are the outputs of the real-time captioning taken during the Tenth Annual Meeting of the Internet Governance Forum (IGF) in João Pessoa, Brazil. Although it is largely accurate, in some cases it may be incomplete or inaccurate due to inaudible passages or transcription errors. It is posted as an aid to understanding the proceedings at the event, but should not be treated as an authoritative record." DR. STEVE CROCKER (ICANN Board Chairman): Good morning, everybody. It's a pleasure to be here. The ability and the pleasure of being here is that among other things, Brazil is a country that fervently backs the multi that so many of us view as a model for internet governance. We're forever looking forward to the future as I mentioned last year's meeting in Istanbul. Let's take a minute and look back briefly at the events of the past year. First of all, about the IGF, we're pleased that WSIS + 10 review draft UN resolution released last week called for an extension of the IGF for another 10 years. That's great. Major point of discussion of the meeting and one of the big accomplishments. The draft resolution also recognizes the need for all stakeholders to engage in dialogue in Internet Governance issues, which is of course what the IGF's all about. ICANN has consistently been a strong supporter of the IGF since its inception, increased its support over the past 10 years; and it views IGF as a positive example for stimulating constructive dialogue on Internet topics on global multistakeholder community. We're active in IGF at all leaves east, presenting in the dialogue and initiatives presented threw these forums. We applaud both on the regional and national levels to garner stakeholders in the development in the developing world. This year ICANN participated in the eighth Latin American Caribbean IGF August 2015 in Mexico. IGF called you are oh dig in Sophia, the 11th Caribbean IGF August 2015 in Trinidad and Tobago and the fourth Africa IGF in September 2015 in Ethiopia. Quite a lot of attention has been focused on the transition of the IANA stewardship and the accountability process. These have occupied quite a lot of our attention and everyone else's during the past year. It was a featured session at last year's IGF in Istanbul and is featured in a main session of a number of workshops here. Of these events, roughly 520 were joined through global webinars or calls, while an additional 345 were attended in person, spanning over 87 countries around the world. That's not enough numbers. I have some more for you. Roughly 300 people have been involved with the working groups. More than 40 meetings have been held. And there have been 25,000 or so mailing list exchanges just on the accountability mailing list. While we're able to track more closely the number of events that ICANN staff and Board have participated in, there have been countless people around the world participating in both you numbering processes coordinated by the regional Internet registries and the protocol parameter processes coordinated by the IGF via phone calls. That's a lot of participation. These have not all been dry. There have been some spirited discussions surrounding the transition at the ICANN meeting in Dublin. And by spirited, I'm sure most of us understand that that means a lot of Guinness and Jamisons, as well. In spite of that, or perhaps because of that, the cross community Working Group on accountability and the IANA coordination group, the ICG, reached significant results. 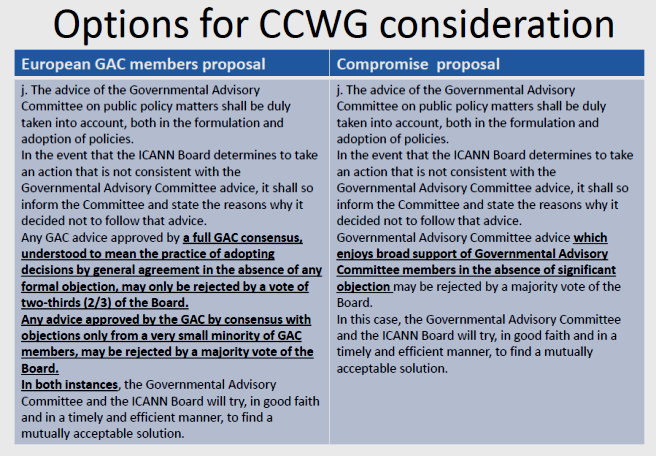 The latter, the ICG finalised its IANA stewardship proposal dependent upon the outstanding dependencies on the naming CWG stewardship and CCWG there will be a test to see if you get all these acronyms. The CCWG made real tangible progress in Dublin on many of their outstanding recommendations, notably deciding to focus on developing the sole designator as the legal enforcement mechanism for their new community powers. It's very important that people stay involved. We know it's been a long process, but the CCWG's getting close and continued engagement and participation will be the key. The CCWG accountability will launch a 35 day public comment on their third draft of work stream 1 recommendations beginning 15 November. That's this Sunday until 21 December. At the launch, the CCWG will launch a 20 to 30 page high level overview of the proposal, a summary of the key changes from the previous draft and documentation on how the proposal meets both the CWG and the NTIA requirements. Approximately 15 days into the public comment, that's at the end of this month, the CCWG will then release the full indepth proposal including appendices and process documentation. 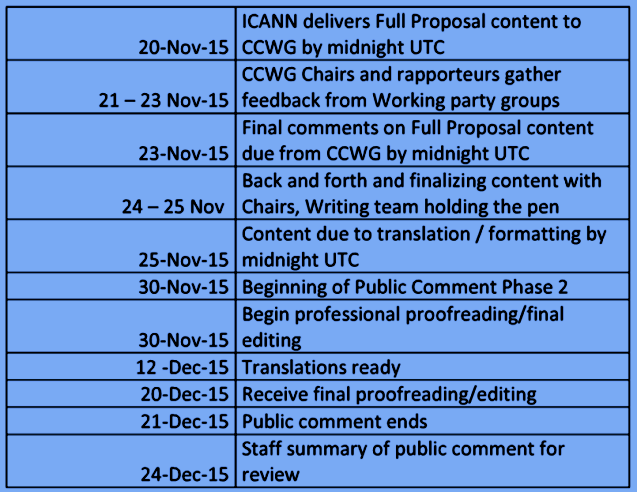 Pending no major changes or concerns raised in the public comments, the CCWG accountability aims to submit a proposal to the ICANN Board by mid January 2016. I'm often asked what will the Board do with that? The Board is committed to transmitting the proposal unchanged. We have reserved the right, as is part of the process, to add whatever comments we want to add. We have inserted well in advance that we won't add any contents that is not what we have previously discussed. And it is our firm intent and hope that we will be entirely supportive of the proposal, that we'll be able to turn it around very quickly and to NTIA that it can be reported. That's the hope. This group more than most realises that the coming year will be a significant one in the history of Internet Governance. It's important that we realize the process we're currently undertaking and it is an important part as the destination will be ultimately reached. I mentioned in Dublin the manner in which we reached that destination will ultimately define us. My hope is that we remain one of inclusivity and transparency. FADI CHEHADÉ (ICANN CEO): Globalization at ICANN works on four levels. At the first level is operational globalization. And I think the record of the last three, four years shows that ICANN has become, in many ways, operationally global. First we divided our Headquarters into three global hubs, one in Los Angeles serving north and South America, one in Istanbul serving Europe, Middle East and Africa, and one in Singapore, serving Asia and Oceana. So by splitting the Headquarters into these three hubs, we were able to also split the main operational functions of ICANN whilst not too long ago, for example, all the legal staff of ICANN was in Los Angeles, trained in U.S. law, we now have legal staff around the hubs so that we can understand and work with our local communities around the world. We also have globalised our support in this area. Today, for the first time in ICANN's history, 24 hours a day, 5 days a week anyone can call an ICANN line and get support in all the UN languages plus Portuguese, plus Turkish and get help and support into the ICANN operations. We have also partnering with certain communities very successfully, for example, in South Korea. We are working with the local community to localise our materials. And this is not just about translation of what we do. This is also in preparing briefs in local languages that help the people in that region understand what we're doing and contribute to what we're doing. This initiative in South Korea is being copied in other places. We have also globalised our expertise. I was just in Cairo on Thursday where we announced the first DNS entrepreneurship centre in the world, in partnership with the Egyptian community. It is already held it has already held 12 workshops training more than 100 people in that region on issues of DNS business, issues of DNS law and policy, issues of technical matters. So these are the things we do to take our expertise and our operations and take them to the world. So that's the operational globalization. The next level of globalization is to make sure that at the geopolitical level ICANN is viewed by the world as an organisation, as a community, as an institution that is accepted to be serving the world, not serving any one community. And I think the work of the last few years also demonstrates, without question, that starting here, in fact, in Brazil, in April 2014, how the Brazilian government embraced ICANN and the multistakeholder model and allowed us to move forward with their blessing and with their support to continue the work we've been doing for over 16 years. Following that, the Chinese government, which for a long time was still searching for its place and role in ICANN, announced at the ICANN meeting in London in June 2014, at the highest level, first time ever in an ICANN meeting, that China is also supportive of one Internet for the world with ICANN and its partners, the IETF and the regional Internet registries coordinating the affairs of the unique protocol identifiers. And then most recently, and really the cherry on top for us, was India's move at the Buenos Aires meeting in June 2015 where His Excellency, Minister Prasad sent us a powerful message how this great message of India, an India that is rooted in democratic, open policies that we all support and embrace, is now joining the global community in its support for ICANN and its role as the coordinator of the unique protocol identifiers. These are geopolitical shifts that happened at ICANN meetings, giving ICANN the geopolitical presence that it needs. And this train continues now with more and more countries as we've signed tens of MOUs in the last four years supporting our role as the coordinator of those functions. That's the second level of globalization. The third level of globalization was to make sure that ICANN itself is independent. You cannot claim that you're global if your affairs are viewed or perceived as being either overseen or controlled by one party. And I think it's pretty clear that the United States Government has had a very fruitful partnership with us for many years; however, the time for a unique role for any one government is done. And I think all of us who have worked so hard over the last two years to finish this phase of our life and to bring to the end the fruitful partnership we've had with the U.S. government and to give ICANN the global independence that it needs is now. And I'm confident, I'm sure many of you are around this table and around this room, that we will finish this project next year, and we will end up with an ICANN that the whole world can see serving everyone without the particular influence of any one group or one party or one government or anyone, but serving the public interest. And, finally, to close, there's a fourth element to globalization. And that's globalising the DNA of a community and of an organisation. And that's the toughest one. I was involved in the 2008 timeframe in the globalisation of a big chunk of the ICANN global services organizations, and I remember how easy it was to build offices around the world, put people around the world. Today ICANN has 30 locations. It's the easy part. Building the globalization is the easy part. The difficult part is to make everyone not just the ICANN staff or the ICANN board, but the ICANN community change the DNA of this organisation to understand our global role and to understand that the billions of people we're adding to the Internet today do not even have a Latin keyboard. It's a brand New World. And the world is large. And the world is complex. But the Internet is for everyone. And if ICANN is to maintain its globalisation, we cannot simply say we have people in 30 countries or 30 locations; we have to say "we think locally. We may act globally, but we think, we understand our communities. We cannot continue to be caught thinking with a U.S. centric or western centric frame. We have to think like the world and we do this by engaging and listening and participating. And I think we're on the way to get there. This is a non stop mission. And I know that ICANN is committed to this. So thank you very much. Question from Peter Dengate Thrush: ... I suppose the question for Fadi is having set those up, what do you see as the next set of challenges and continuing that? Do you see more offices? Do you see more people or some other way forward? I know you're going to be leaving shortly, but if you were to look back in three years' time, what would you hope would have been achieved in that period? FADI CHEHADÉ: I do not believe that the next three years will require a major further expansion of ICANN and its size or staff. Quite the opposite. I made the commitment, as you know, to start slowing down the growth of ICANN. And we are on track. We have slowed down the growth last year and this year again and next year to make sure the growth kind of levels where we are. In terms of specifics, I do believe we before I leave, I hope we will complete the strategy and the implementation of adding one more engagement centre in Africa. That's something I'm hoping we can get done. Right now, if you look at the ICANN presence map, quite frankly, besides Baher in Egypt, it's a little bit lacking. So we will address that. And the community is now in dialogue to help us figure out how to do this. I do believe the central theme of the next three years will be set by our Board and my successor, who will hopefully be named early next year. But my sense of this and I haven't thought about this, so I'm being direct with you here is that what ICANN needs to focus on in the next three years is trust, is strengthening the trust in our organisation. And it starts at home of the it starts building the trust between us and making sure that the parts of our community feel that we're working together. We've been rightfully battling. A little bit of mistrust is always good, as professor Hofmann told me yesterday, it's good because then we check on each other. But we need to find that balanced middle ground. And the institution, the community and everything we do has to strengthen that trust so that also when people come from outside for the first time, they see us as a community that may battle, but at the end of the day there is trust in this community. And you've built it when you were at the helm. We continue to build it. And I believe that the next phase will be very important, even more important because we are though now an independent organisation, and the world will need to trust us to do what we do and do it well, inclusively, openly. So I really hope that we don't lose that momentum, that we continue in that direction. And I'm confident, by the way, everything I see in the Board's activities to prepare the new CEO and to prepare for a new CEO is very assuring and reassuring. And I'm confident ICANN will continue in its trajectory. Question from Steve DelBianco with NetChoice and the ICANN Business Constituency: Fadi, even if we were on a boat in the middle of the ocean, I realize that it isolates the employees from those regimes; but we do create policies and enforce contracts that affect registrants and users all over the world, and therefore those activities are subject to the laws of the countries where those registrants and users live. So the speaker who asked the question might have thought that putting employees into country means that ICANN has to ensure that the laws of that country are respected, but that's the case anyway, whether the employees are there or not. There are special concerns about employees, but they don't suddenly increase the need to pay attention to laws. And, Fadi, your answer to Peter about ICANN's evolution used the word "trust" many, many times and I'm not even sure how that would translate into all the languages we work with. But in the accountability transition track, I don't really know that trust was at the nub of coming up with the community accountability mechanisms. It's more about the community if it disagrees with the management and Board's interpretation of some very fluid concepts like fiduciary duty, global public interest. These are concepts that are difficult to nail down. And there may be instances where the community as a consensus comes together and says" respectfully, Board, we don't agree with how you've interpreted your fiduciary duty on this. "And that is why the community powers are designed. And that disagreement has nothing to do with trust, right? It has to do with a different perspective. When you're on the board, when the people move from this side of the table to the Board they are now have more of a duty to the corporation than they did before and it's a broad duty to the public interest of the community. So it's not about trust as much as it is about disagreement of interpretation and I think that helps to take the temperature down because we didn't really have a trust problem as much as a disagreement issue. FADI CHEHADÉ: When I speak about trust, I'm not speaking about trust between individuals. You and I trust each other and know our intentions are good. I'm speaking about institutional trust. So everything the community has done to strengthen accountability increases the trust in the institution. These things are very congruent and I think we're aligned. That the community putting the right checks and balances within this institution and the community is precisely what makes anyone looking at us from the outside say "this is a trustworthy institution and community because they check on each other, they have a healthy dose of mistrust between part of the organization that allows them, then, to check on each other." So I think the work on accountability is in many ways a tremendous boost for in making ICANN a trustworthy institution in community. And, frankly, I know the role you and many around the table have played, Jonathan and others, and, frankly, history will show that this is what made ICANN a better place and a more trustworthy place. Comment from Veni Markovski, ICANN's Vice President from UN Engagement: ... The globalization efforts are positively accepted at the United Nations. Through the work of ICANN, GAC participation but also ICANN has government engagement team people in EURIC of and Geneva. This allows us to share knowledge about ICANN and what it does to all UN agencies and to the permanent missions to the UN as well as the knowledge about UN and its Internet relationship work to ICANN. This bidirectional constant communication is a good example of how the Internet has changed in the last few years. When Will the IANA Transition Be Finished? FADI CHEHADÉ: So just to remind you history wise. The transition was announced on March 14th at 2:30:00 p.m. U.S. Pacific time in 2014. That's when it was announced. That's when the train started. So it's been, let's say, a little less than two years. The community has been working very hard to get a proposal ready for the U.S. government to review and to grant us the end of this stewardship, the contract, essentially. At the moment, expectations are and I'm going to either hear people stand up and yell at me or agree with me is that we will give the U.S. government the proposal sometime in mid January 2016. Any disagreement from those who are driving the bus? Because I'm not driving the bus. Plus or minus. Add a couple of weeks here or there, let's say mid January 2016. And then the U.S. government has to consume this proposal. They have to study it, to review it. At the end of that process, the U.S. government should either say they're okay with the proposal or they're not okay with the proposal. The expectation is that that will happen sometime in the March/April/May timeframe. So the U.S. government has always said they need 60 to 90 days to do that. So if you add 60 to 90 days to mid January, then you're looking at mid March to mid April. That's at least the current plan. And then after that, we are just implementing the proposal. And at the moment, our community has looked at the implementation and believe that we will complete it on time before the contract expires on the 30th of September, 2016. Naturally. The contract will expire naturally at that point. If we're not done, or if the implementation is not done, then 30 days or so prior to September 30th, 2016, the U.S. government could either in agreement with us or unilaterally extend the contract further. At the moment, no one is expecting this will occur, but it could and that's what we're working against. I hope we answered your question and thanks for your patience through the process. We're working hard to get it done.